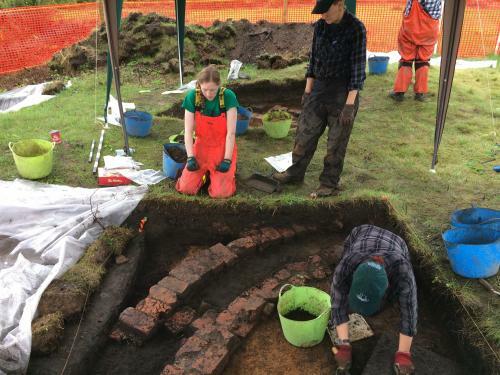 Archaeologists ponder the purpose of this channel lined with brick. It goes in a different arc from similar channels uncovered in other pits. A team of four archaeologists stepped into the pits after the public dig was over, to advance our excavation and to document the features found, changes in soil colour or type, and any anomalies. Working for two days, they uncovered two more brick features, one curved and one straight. Both appear to be brick channels, air vents, or troughs of some kind, but where they start and end is a mystery saved for another year’s work. 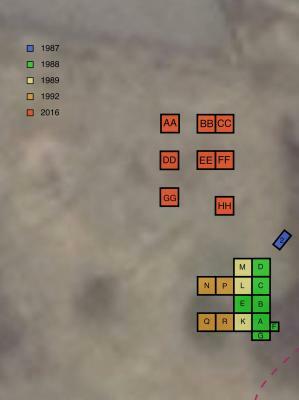 Plan of the approximate locations of pits created by our archaeology program. Courtesy of Laura deBoer. Lead archaeologist Laura deBoer noted: “the beautiful thick sand layers that were found next to the brick are likely part of the casting floor of the foundry, used for large projects when a box of sand for moulding molten iron wasn’t big enough. Artifacts found in this area are consistent with both casting work (metal ‘spills’ in the sand, signs of heat damage, coal fragments) and of finishing work (two large metal files, brass filings, other tools).” Take a look at the results of their efforts.